The great appeal of this race game comes from the programming of future moves and simultanous execution of them. This provides lots of chaos and laughs when even the best plans are destroyed by the interference of the other robots. This game applies the most basic commands (forward, turn left, turn right, back up...) to a death trap map board on little robots. It sounds simple and orderly, but when you flip over your command actions... and your robots start ramming one another... all Hell breaks loose. It's very fun and a great example of chaos and unpredictability without a surfeit of randomness. A very fun group game for 2 to 8 players. I love robots and programming things. Naturally, I knew this was the game for me! It has not let me down and has proven to be a fun, chaotic experience. It is definitely a game where you can't take yourself too seriously; don't get upset when your best-laid plans to awry! That just makes it even more fun! I am a great fan of game with simultanious action selection, since it eliminates or reduces downtime in games significantly. 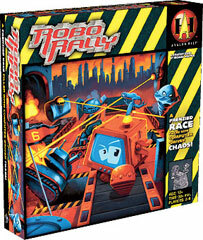 In Robo Rally, the simultanious programming and simultanious execution of orders also helps to create a lot of the chaos that makes this game so fun. The best laid plans can be altered by an unexpected (or even uninteded) move by one of the other players, and it is amazingly fun to see the chaos and destruction that can follow through the many chain reactions between robots and board elements.